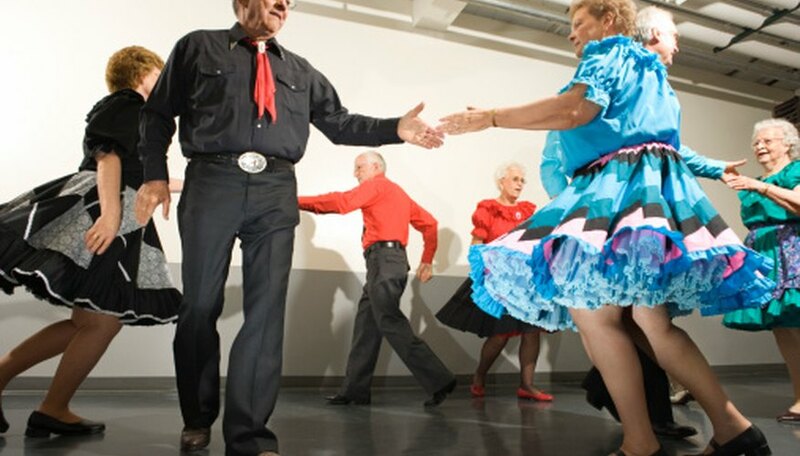 The Boot Scootin' Boogie Line Dance has been a fixture at country themed bars and restaurants for many years. The dance is done traditionally to the Brooks and Dunn song "Boot Scootin' Boogie," though it can be adapted for other songs as well. The actual steps of the dance vary by region, but once you know one version, you can easily adapt to others. There are 25 steps to the dance that are then repeated until the end of the song. Stand with you feet together. Balance on the balls of your feet and swivel your heels outward, then swivel them back together. Repeat once. Stand on your left foot and swing your right foot forward. Tap your right heel twice on the floor in front of you. Swing your right foot backward and tap your toe twice on the floor behind you. Swing your right foot forward and tap your heel once on the floor in front of you. Bring your feet back together. Balance on the balls of your feet and swivel your heels together to the right, then back to center. Stand on your right foot and swing your left foot forward and tap your heel once on the floor in front of you. Balance on the balls of your feet and swivel your heels together to the left, then back to center. Step with your right foot to the right. Step with your left foot to the right, bringing it behind your right foot. Bring your left foot to your right foot, touch your toe to the floor and clap. Step the the left with your left foot. Step the left with your right foot, bringing it behind your left foot. Step to the left with your left foot and pivot 180 degrees to the left on the ball of your left foot. Step the to right with your left foot, bringing it behind your right foot. Step the right with your right foot. Bring your left foot together with your right foot then touch the toe of your left foot to the floor. Step to the left with your right foot, bringing it behind your left foot. Bring your right foot together with your left foot and clap. Jessica Hensley began writing professionally in 2010. She wrote an opinion column for her university newspaper, "The Collegian." Since then, her work has appeared in various online publications. She graduated from Kansas State University with a Bachelor of Arts in political science.